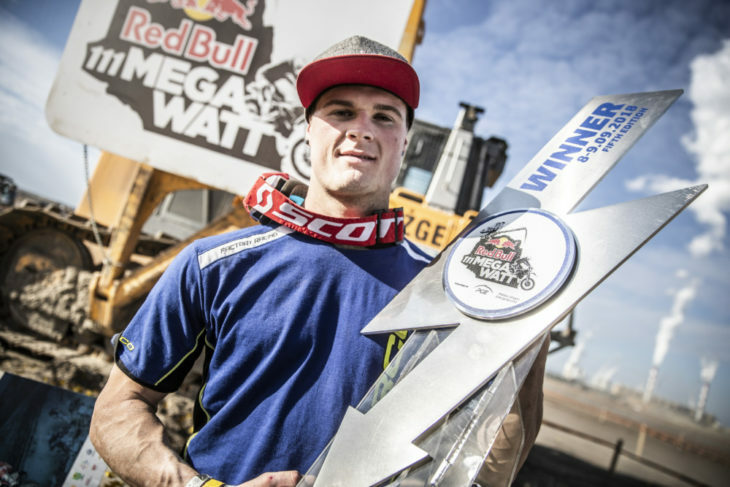 Sherco Factory Racing’s Wade Young scored the overall win at the Red Bull 111 Megawatt in Poland, September 8-9. 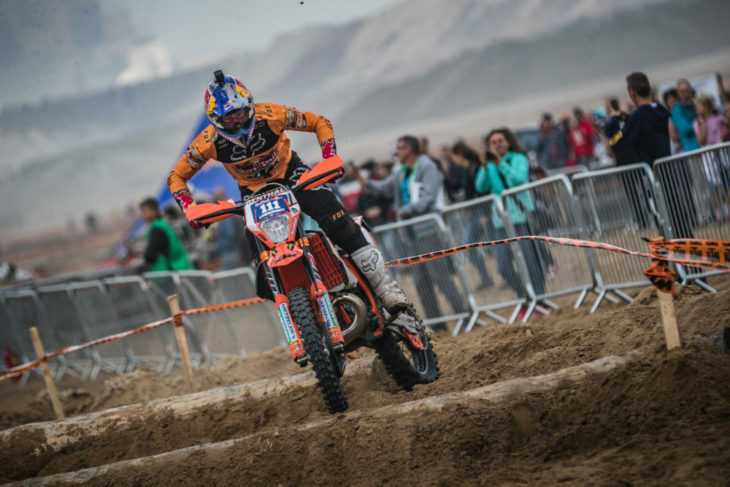 The race was round five of the 2018 World Enduro Super Series (WESS) and was Young’s second win of the championship. Second in the race was Poland’s own Taddy Blazusiak (Red Bull KTM) and third went to Great Britain’s Billy Bolt (Rockstar Energy Husqvarna). It was a dramatic turn of events, as series leader Jonny Walker (KTM) crashed out of the race on lap two of three, while Germany’s Manuel Lettenbichler (KTM) overcame a slow start to place fourth, and with it, take control of the championship standings with three rounds remaining. After a busy day of qualification on Saturday, the 500 fastest riders in this year’s Red Bull 111 Megawatt took to the start line in Europe’s largest coal mine for Sunday’s feature race. Faced with a demanding and physical 18-mile (30km) course that wove its way around the quarry, the addition of hot weather and dusty tracks ensured a grueling three-lap race for the world’s best Enduro riders. As pole sitter, Nathan Watson (KTM) was quick to claim the holeshot when competitors blasted off the line. Leading through the Motocross and Endurocross sections, Watson slipped back one position when Walker found a way past his teammate as they entered the quarry. Spending the opening lap sizing each other and the terrain up, Walker controlled the race lead, as Young, Blazusiak and Bolt all shadowed him. However, drama quickly struck as they headed into the mine section for lap two when Walker crashed in the dust. Young duly inherited the lead and it was a position he would hold until the checkered flag at the end of lap three, building a winning margin of over two minutes. Behind him, the fight for the remainder of the podium places proved close between Blazusiak, Bolt, Watson and Lettenbichler, who overcame a slow start. Fending off a late attack by Bolt, Blazusiak claimed the runner-up result in his home race. Crossing the finish line just seven seconds behind, Bolt took third, while Lettenbichler ended his race in fourth. After setting the early pace, Watson completed the top five. Riding steadily throughout, Spain’s Josep Garcia (KTM) was sixth, finishing one-minute clear of South Africa’s Blake Gutzeit (Yamaha) in seventh. Round-two winner Graham Jarvis (Husqvarna), despite not favoring the sandy terrain, fared well to claim a top-10 result with eighth, with his teammate Alfredo Gomez ninth. Paul Bolton (KTM) rounded out the top 10. In total, 178 competitors finished this year’s Red Bull 111 Megawatt. Unfortunately, one of the stars of the sport, Jonny Walker, was injured during the race. Walker crashed while leading the race and fractured both bones in his lower left arm, close to his wrist, and fractured his fourth finger on his right hand. He also dislocated his left shoulder. Walker also has extensive bruising all over his upper body, but despite feeling somewhat beaten up, and disappointed at having lost his lead in the World Enduro Super Series championship standings, he remains in good spirits and is optimistic of a full and speedy recovery. The World Enduro Super Series continues with round six at Great Britain’s Hawkstone Park Cross-Country, September 22-23.